How to handle the battery drainage issue in realme smart device? Learn troubleshooting steps for battery drainage issue. 1. Update the app and phone system to the latest version. 2. Reinstall the app, or install another similar app instead or uninstall it. 1. Update the system to the latest version. 2. Use the phone at 0°C-35°C environment. 3. Use original charger and right format power bank. 4. Charge the battery to 100% power percent each time. 1. Turn off GPS, Bluetooth, hot spot, Wi-Fi and Auto-sync when not in use. 2. Turn on auto brightness adjust，set auto screen off less than 30 seconds. 3. 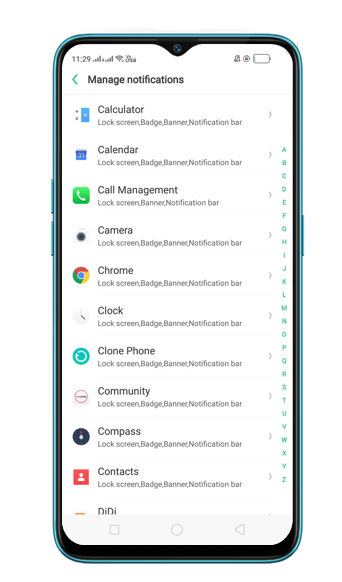 Clear background Apps, tasks and clear caches regularly in phone manager. 4. Limit the App self-starting in Phone manager>Privacy Permissions>Startup Manager >choose the App to want to limit. 5. Not receive the useless notification in Setting>Notification & Status Bar>Manage Notifications. 6. Use the phone under good Internet condition. 7. Open power save mode in Setting>Battery>Power Saving. 8. Still has a battery drainage problem, please send for repair to the local service center.